« Tonight is Culture Night! Those of you who have been following my recent updates on progress with The Open Journal of Astrophysics may be interested to hear about `Plan S’, which is a proposal by 11 European Nations to give the public free access to publicly funded science. The 11 countries involved in this initiative are: France, Italy, Austria, Ireland, Luxembourg, the Netherlands, Norway, Poland, Slovenia, Sweden, and the UK. Since the plan will not come into effect until 1st January 2020, which is after the UK leaves the EU it is by no means clear whether the UK will actually be involved in ERC initiatives after that. Norway is not in the EU but is associated to the ERC. It is unlikely that the UK will have a similar status after Brexit. Anyway, these 11 countries have formed `cOAlition S’ – the `OA’ is for `Open Access’ – to carry out the plan, which can be found here. You can read more about it here. I have not yet looked at the details of what will be regarded as `compliant’ in terms of Open Access but if the the Open Journal of Astrophysics is not fully compliant as it stands, I expect it can be made so (although we are a genuinely international journal not limited to the 11 countries involved in Plan S). 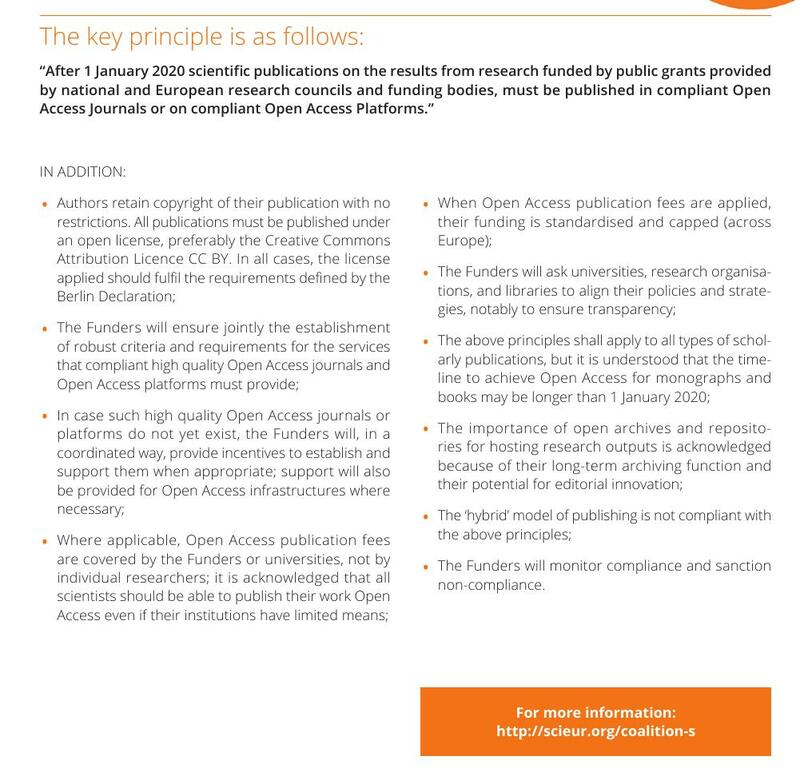 Anyway, although I support Plan S in general terms what I sincerely hope will not happen with this initiative is that researchers and their institutions get mugged into paying an extortionate `Gold’ Open Access Article Processing Charge (APC) which is simply a means for the academic publishing industry to maintain its inflated profit margins at the expense of actual research. The Open Journal of Astrophysics is Green rather than Gold. In fact the cost of maintaining and running the platform is about $1000 per annum, and the marginal cost for processing each paper is $10 or actually $11 if you count registering published articles with CrossRef (though we do not incur that cost if the article is rejected). In effect running the entire journal costs less than a typical APC for Gold Open Access for one physics paper. Those costs will be born by my institution, Maynooth University. The UK was conned into going down this route some years ago by the publishing lobby, and I hope the other cOAlition S partners do not fall for the same scam. This entry was posted on September 22, 2018 at 4:08 pm and is filed under Open Access with tags APC, Article Processing Charge, cOAlition S, Gold Open Access, Green Open Access, Open Access, Plan S.	You can follow any responses to this entry through the RSS 2.0 feed. You can leave a response, or trackback from your own site. Open Access Gold creates a market, where scientists rather than libraries have the say over where the paper goes and what price they pay. The main impediment to the market operating efficiently to lower prices is not the publishers, who will generally always try to raise prices. it is the effective monopoly that we, the scholars and especially the universities, give to certain journals by ranking them as ‘prestigious’ (= high impact). Universities look on such simplistic ratings as important in promotions. So if we are to exploit this market that the EU is creating and that can in principle lower prices, then the universities have to get smarter about how they judge the quality of their staff and their hiring/promotion procedures. If those who make such decisions hire people based on the quality of their work, rather than having something published in a prestigious journal, then this problem will go away. This by no means implies that people should publish in a low-quality journal, i.e. one which will publish anything without even peer review. But it does mean that those who have the money to pay page charges or whatever should not be disadvantaged compared to those who don’t and publish work which is at least as good or better in some other quality journal. There is a conflict of interest with Gold Open Access, namely that the journal earns more the more it publishes. Due to inertia, even a prestigious journal will remain such even after publishing less-than-standard material for profit. This isn’t a problem with the subscription model, where the journal has a motivation to keep its standards high. So not only does Gold Open Access simply shift the source of money from subscriptions to page charges, it also creates a wrong incentive. It is a shame that the Gold folks have hijacked the term. There are lies, damn lies, and Gold Open Access. I also don’t accept the argument that Gold Open Access at least makes stuff available to the taxpayer or whatever, since almost everything can go onto arXiv. Norway is not an EU country. Indeed but it is associated to the ERC. OK, but it is still not in the EU. The headline gets it wrong as well. There are many EU institutions. Is there a theorem which says that a Venn diagram is always capable of construction? And this doesn’t even include the ERC, ESA, ESO, or the EBU. Made the same mistake myself. 😐 It should be “there are many European institutions”. Bonus points if you recognize all the flags. https://en.wikipedia.org/wiki/Mohamed_El_Naschie demonstrates as well how easy it is to scam impact factors, university rankings, and so on. From the document you linked to it is not clear how much money is involved. There is talk of “funders”. So it looks like Gold Open Access to me. Just a couple of days ago I was reading an article in Physik Journal (member organ of the German Physical Society) which said that current negotiations in Germany involving open access had been delayed because the journals (mainly Elsevier) had not been cooperative. I don’t know what the strategy forward is. Several institutes have cancelled Elsevier subscriptions (and in some cases been given complimentary access in a last-ditch attempt to save credibility). I think that two things need to happen. First, the community should state the terms and if Elsevier or whoever doesn’t comply, just drop them. Quickly. * Second, the goal must be Green Open Access. People should wake up and smell the coffee and not be duped by plans to move payment from subscriptions to page charges or to some wholesale funding. Yes, it is good to have stuff openly accessible, but at least in many cases arXiv provides that (and one should be suspicious of people who don’t update their arXiv stuff to match the accepted version and advertise the fact). However, this small advantage is dwarfed if the profit made by publishers derives not from subscriptions but from page charges or by some sort of wholesale funding. A good start would be some sort of publicly visible platform where scientists (starting with those with tenure) publicly pledge to publish only in Green-Access journals, no exceptions. * Possible caveat: How many papers are available only behind paywalls which will be lost forever if Elsevier et al. are booted out? Sigh. The journal you mention *is* a Gold OA journal–one that, like 70% of DOAJ-listed Gold OA journals active in 2017, does not charge APCs. Don’t confuse APCs with Gold OA. Thank you for your sigh. As fast as I can tell the OJA is Green by some definitions and Gold by others. It may even be Diamond or Platinum. The problem as I see it is that in a field that is changing very rapidly `long-agreed’ may cease to be useful. Indeed. Is my summary of the definitions correct? So OJA is gold because it gets EUR 1000 per year or whatever from the university. What if it got nothing, but was run purely on a volunteer basis? What colour would it be then? A journal run entirely on volunteer labor is gold OA. Always has been. It’s a no-fee gold journal. Transparency in funding levels and sources is desirable, but is a separate issue. It’s not exactly volunteer.It’s part of my job as an academic, and I do get a salary. Right. I also think that some overpriced journals deliberately want only a few categories. In particular, once Gold access is deemed OK, they don’t want overpriced Gold to be distinguished from sensibly priced Gold. As far as I can tell, OJA is platinum/diamond (I don’t think that there is any difference between these), though relying on the green arXiv. Personally, I think that platinum/diamond or green (though in parallel with more traditional publishing*) is the way to go. The problem I see with gold is that APC disadvantage poor authors and also create a conflict of interest on the part of the journal. Both APCs and wholesale sponsoring (by institutes, national research councils, whatever) do not by themselves solve the problem of vastly inflated costs. * Of course, I don’t think that the traditional publishing should be via a journal which charges inflated fees, whether or not these are paid by the author, directly or indirectly. But I have no problem with a journal which allows parallel posting to arXiv (or elsewhere) without embargo and is not outrageously expensive. Some people might think that the infrastructure of such a journal is worth a modest price, e.g. language editing (not only for non-native speakers), ensuring something like a uniform house style, and so on. Also, at least until the OJA is up and running, such journals (e.g. MNRAS) provide the quality control which is missing at arXiv (arXiv itself says that it has moderators, not referees, and they perhaps separate the wheat from the chaff but don’t further process the wheat). So APC implies gold (at least if the journal is OA at all; there were (still are?) some journals with page charges which were (still are?) not OA (ApJ comes to mind), but gold does not necessarily imply APC. To my knowledge, the long-standing definitions have gold for what you (Phillip) are now calling gold and diamond/platinum. Most gold OA journals–70% of those in the Directory of Open Access Journals–do not charge APCs. The equation of Gold with APC has been convenient for opponents of OA, but is a recent and to my mind unwelcome complication, as are using “diamond” or “platinum” for no-fee gold. I can’t dictate terms to be used, but my series of SPARC-funded comprehensive surveys of serious gold OA ceases to make sense if others assume “gold=APC.” It doesn’t and shouldn’t. On the other hand, if it’s based on self-archiving via the arXiv then isn’t it also Green? The arXiv is green, but OJA itself would not be. As I noted, APCs implies Gold (assuming the journal is OA at all; there can also be APCs for non-OA journals) but not vice versa. Yes, it is bad to confuse the two. However, how can one paint a more detailed picture if new terms such as Diamond and Platinum (not sure if there is any difference) are not introduced? I see a real problem with doublespeak with high-priced Gold journals jumping on the OA bandwagon and whitewashing themselves, saying that they are helping the community by being OA but at the same time still charging exhorbitant fees. It’s probably worse if they are not via APCs or via subscriptions; if some national funding body or whatever pays them, the rank and file notice less how exhorbitant they are. It is simply not a good idea to say “We are OA. It costs $1500 to publish an article.” While worse if the author or his institution has to pay it, it is too much money. If the OJA is Gold, as seems to be the case according to the normal definition, then we really need a term to distinguish it from OA-for-a-too-high-fee journals. By lumping them all into Gold, the main problem is swept under the rug. In the past, there was a real reason to pay for journals; there was no other way to disseminate information. That has changed. Lamplighter is no longer a job people can have. The journals will just have to deal with it.